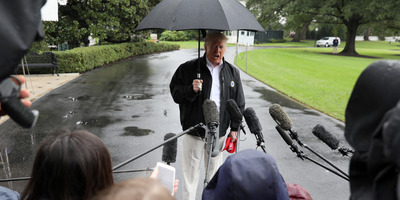 Jonathan ErnstPresident Donald Trump on Monday suggested ‘rogue killers’ could be behind Jamal Khashoggi’s mysterious disappearance. President Donald Trump on Monday suggested “rogue killers” could be responsible for the disappearance of Saudi journalist Jamal Khashoggi, without providing evidence. Trump said King Salman strongly denied any involvement in Khashoggi’s disappearance. Khashoggi disappeared after entering the Saudi consulate in Istanbul in early October and is feared dead. Khashoggi had often been critical of the Saudi government in his writing. President Donald Trump on Monday suggested “rogue killers” could be responsible for the disappearance of Saudi journalist Jamal Khashoggi, touting the Saudi king’s “very strong” denial of involvement. The president spoke with reporters about the Saudi Arabian government’s denial of any involvement in Khashoggi’s disappearance after a phone call with the Saudi king. “It sounded to me like maybe these could be rogue killers, who knows?” he said. The president also said King Salman “flatly denied” any knowledge of Khashoggi’s disappearance. Trump tweeted about the phone conversation earlier on Monday and said he’d sent Secretary of State Mike Pompeo to Saudi Arabia to meet with the king. Just spoke to the King of Saudi Arabia who denies any knowledge of whatever may have happened ‘to our Saudi Arabian citizen.’ He said that they are working closely with Turkey to find answer. I am immediately sending our Secretary of State to meet with King!” he tweeted. The State Department subsequently confirmed Pompeo was en route to Saudi Arabia. Trump has been under mounting pressure amid Khashoggi’s disappearance. Critics say he’s setting a dangerous precedent regarding the US’s stance on human rights. The president last week said it would be a “tough pill to swallow” to cease billions of dollars of arms sales to the Saudis over the Khashoggi case. Khashoggi disappeared after entering the Saudi consulate in Istanbul in early October to obtain documents to marry his Turkish fiance, Hatice Cengiz. Cengiz said she waited outside of the consulate for roughly 11 hours, but Khashoggi never came out. Turkish officials have accused Saudi Arabia of sending a 15-man team that killed Khashoggi in the consulate, dismembered his body with a bone saw, and sent it back to his native country. Various reports have suggested the orders to detain or kill Khashoggi came directly from Crown Prince Mohammed bin Salman. Saudi Arabia has claimed without supporting evidence that Khashoggi left the consulate. Khashoggi, who was often critical of the Saudi government in his writing, was a US resident who wrote for The Washington Post. His disappearance has sparked international condemnation of Saudi Arabia and its dubious record on human rights, particularly when it comes to dissent and freedom of the press. The president’s unsubstantiated suggestion on Monday the Khashoggi disappearance could’ve been the work of “rogue killers” is reminiscent of when he controversially said a 400-pound hacker could be behind interference in the 2016 presidential election. The US intelligence community has definitively concluded Russia coordinated a broad effort to interfere in the 2016 presidential election.